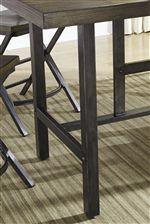 This side chair offers unique style to your dining space with its medium brown reclaimed look and metal frame with crisscross leg design, which is finished in a metallic brushed effect. 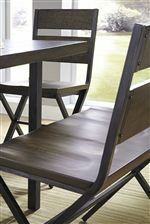 The vintage style look will add a lovely touch to your dining space, while the contoured seat offers comfort. Adjustable levelers complete the chair. The Kavara Distressed Pine Wood/Metal Dining Room Chair by Signature Design by Ashley at Crowley Furniture & Mattress in the Kansas City Area: Liberty and Lee's Summit, MO & Overland Park, KS area. Product availability may vary. Contact us for the most current availability on this product. Dine in style with the Kavara collection, constructed with select pine veneers and hardwood solids finished in a warm brown for a reclaimed look. These pieces are designed with comfort and functionality in mind. The rectangular dining room counter table and standard height table have a casual appeal. Adorned with nail heads, the tables offer vintage flair. Try out one of the counter height double bar stool or double dining chair, with room for two and never run out of space at your next family gathering. There are countless combinations with the chairs, stools, and benches, go casual or semi-formal it's all up to you. Bring this distressed vintage look to your home today. The Kavara collection is a great option if you are looking for Relaxed Vintage furniture in the Kansas City Area: Liberty and Lee's Summit, MO & Overland Park, KS area. Browse other items in the Kavara collection from Crowley Furniture & Mattress in the Kansas City Area: Liberty and Lee's Summit, MO & Overland Park, KS area.